Have you ever considered starting a business that takes advantage of your crochet skills? Maybe you have thought about or even started selling your creations at craft fairs or to friends and family? Perhaps you have designed patterns and are thinking of offering them for sale? But, where to begin? Or, maybe you have been selling at craft fairs or listing patterns on Ravelry or Etsy, but you just aren’t getting many sales, even though you do great work? Starting a crochet business, or any business is hard work and one of the best things you can do for your business is find a mentor or someone who can help you because they have done it. So, with all that in mind, my friend, Pam Grice, decided to offer help to crochet business owners and those who want to start a crochet business. 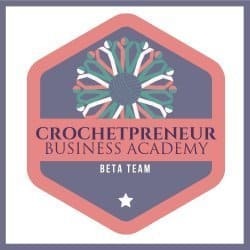 So, she has opened the doors to her Crochetpreneur Business Academy and I got the opportunity to be part of her beta testing group and get a sneak peek at all that CBA has to offer. So, since I have been in the membership program, here is what I see as the top 3 benefits of joining the Crochetpreneur Business Academy! The links in this post are my affiliate links, so if you happen to join CBA or purchase any of Pam’s other awesome content, I will get a commission at no extra cost to you. I don’t link to anything I wouldn’t personally recommend, ever. Pam has been there and done that….seriously, that is probably my favorite thing about her sharing her expertise. She doesn’t just talk about it, she has done it and continues to do it. Craft fairs – yep, she has done those and still is doing those! She has all kinds of tips and tricks for making your craft fairs successful. In fact, you can sign up for her Rock Your Craft Fairs course for free! Etsy sales – yep, she has done that too…for years! She even had a listing go viral…like really viral! I will let her tell you the details, but again, she continues to list on Etsy and has a whole section in CBA about optimizing your Etsy shop. Blog – yep, she runs two blogs! Her Crochetpreneur blog and her Made With A Twist blog. She has built those blogs up and has enough traffic to qualify for a top ad network. So, she has included blogging as a category in CBA too. So, that is what drew me to Pam right away. She has the experience with all these aspects of the business and offers solid advice and help in every area. She doesn’t just throw up a page about how to start a blog in 3 seconds, she walks you through the steps and tells you all the hard parts. Plus, she is there to walk you through it too. Okay, so Pam is experienced and super helpful, but that doesn’t do any good if the membership doesn’t have any content, right? So, the membership area is built around the main three areas of product sales, designing, and blogging. Each topic has a whole “course” section devoted to it. She has included videos and tasks for you to complete in each area that help to move you from point A to point B in your business. It isn’t just a lot of theory, Pam includes actionable steps to push you forward in your business. Oh, and the content that is in the membership area is awesome, but the bonus is that she is going to continue to add more and more content as time goes by. So, even though the materials in there now are wonderful, know that you will get even more as the months progress. Also, Pam will be the first one to tell you that even though she has seen a lot and accomplished a lot, she is still learning and seeking out more knowledge herself. So, as part of the CBA content plan, she will be bringing in expert guests from all the areas to help us learn more about all these aspects of our businesses. So, with that membership, you will get fresh content from multiple sources coming in each month, not just a one and done course that never gets upgraded. A lot of people think we are crazy! How in the world can someone earn money with a hook and some yarn? Your friends and family might be supportive, but they just don’t fully “get” what you are doing or dreaming of. So, do we just sit alone on your couch with your yarn? Nope, we seek out like-minded crocheters who are on the same path and who speak our language! Pam has built and continues to build the community around CBA. Honestly, I love the support and help that everyone provides. There are experienced and new business owners in the group, but no competition, just collaboration and cheers. She does live Q&A sessions in the Facebook community and answers questions and seeks out answers if she doesn’t know. She is very supportive and helpful and focused on helping you grow your business. It is nice to have a coach in your corner! Those are just three of the main benefits that I have gotten from my experience in the Crochetpreneur Business Academy. I did want to add that I think CBA is not for everyone though. If you are not really interested in growing your business and not will to work hard, then it probably isn’t a good investment. Pam is great and puts all the tools and processes there for us, but we are the ones that have to do the work. She can’t do it for us, but her guidance can help make the path to success smoother. I do believe that if you are looking to start or grow your crochet business, you will get as much benefit from The Crochetpreneur Business Academy as I have after just a few months in the beta program! Hope to see you there!